I qualified as a physiotherapist in 1998 which seems a long time ago now. It was right on the cusp of a new era of physiotherapy treatment. During my training I spent a lot of time electrocuting people with various strange looking machines with the goal of curing all injuries and getting rid of all pain. Whilst I was becoming a qualified practitioner learning my trade in the health service and studying for a Master’s degree these machines were being pushed aside in favour of the next trend - suddenly all ailments could be cured not by electricity but simply by ‘activating your core’. A new muscle was introduced to our lexicon. The ‘transversus abdominus’ the magic cure all for back, knee and shoulder pain. Just get the patients to lie on their back and work this muscle in a very specific and magical way and all would become well with the world. I set about my job of activating patient’s cores with great gusto, armed with my new argot - “zip and hollow”, “tuck in”, “gently pull your core into your spine”. It had to be just right or it wouldn’t work. Once your patient's core was activated they were then shown how to challenge it using a very specific and precise series of exercises. We even had a gadget to measure whether the patient was perfectly working the core. The result of all this precise deep abdominal activation was, well, not a lot. I then started reading the research it was all based on - a few studies by some Australians - and realised that there were significant flaws in their arguments. Further reading found that there were many ways to work the muscles around the back and many of them far more enjoyable and effective than the strange ritualistic exercises we had been prescribing. For me the final nail in the coffin came with a study published a few years ago showing that whilst exercise does help to reduce lower back pain no particular type of exercise is any better than any other (study). What next? A period of sober self-reflection, perhaps challenging ourselves and our assumptions as medical practitioners? Or instead, how about a new wonder muscle? The Glute. Suddenly all my patients had weak, underactive, lazy glutes that just weren’t firing. The cause for all these deactivated bums? Too much sitting. So you poor runners with your ITB, shin splints and achilles pain had all better get your glutes firing. Squeeze squeeze squeeze. You’d better clam and bridge for all you’re worth. So everyone got better, right? Guess what? Results were sketchy. Some patients recovered, others did hundreds of clams and bridges daily with no change to their symptoms. So I shouldn’t bother with glutes exercises, or core, or Physiotherapists for that matter? Well, not quite. All these muscles are important and may need looking after but they aren’t a cure for all pain and ailments. The largest bum muscle, gluteus maximus, is a powerful muscle that helps power you forward when you run. The faster you run the harder the glute has to work. This is why sprinters tend towards a rather large behind. 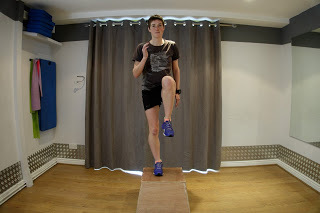 The deeper gluteus muscles (medius and minimus) support and stabilise the pelvis as you run so when you land on one leg they provide the scaffolding to keep the leg steady to enable you to push off. So they are really important? Yes…... but as part of a whole system. They work with other muscles, fascia, tendons, bones, joints, and nerves. These other tissues and muscles all have their own part to play. Strengthening the glutes in isolation will rarely do very much. In clinic I often see patients with ongoing issues after being treated by several other physios. They arrive confused and frustrated with their problems. Like many others they have been told that the cause of their problems is a weak core, glutes or both and have then engaged with their prescribed exercises for sometime with little benefit. Sarah arrived in clinic with ongoing lower back and bum pain that was stopping her enjoying running. She had seen a physio previously who had declared that her glute wasn’t working. She had been given the standard bridges and clams and worked hard at getting her glute to work. But the pain continued and she still struggled to run. Her logic was that despite all the work she had done she still had a ‘weak’ glute. Her glute whilst lying on her side was very strong but in the one leg stand position which is key for running this strength didn’t translate into a strong stable leg. 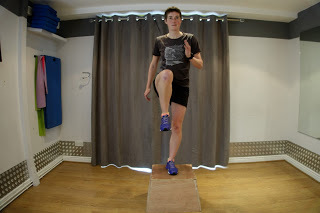 She underwent a rehabilitation program focusing on balance and control on one leg, working all the muscles including the glutes in a running relevant position. She improved quickly and then slowly built up her pain free running over time. Like Sarah, Mary came to see me after having seen several other physios. She had pain in her hamstring tendon which kept flaring up when she did a bit more running especially downhill running. She had been told she had poor biomechanics on the injured side and needed to strengthen her glutes to correct this. 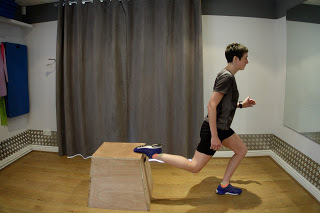 On assessment the hamstring muscle on that side was much weaker, following a previous tear, thus when running downhill the weak hamstring caused more load on the hamstring tendon. 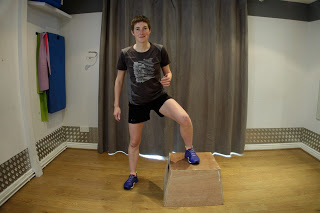 For Mary treatment was based around hamstring strength work and advice on building her running up and discussing technique when descending. John came to see me after nearly two years of pain and frustration following an accident which injured his knee. He had been prescribed many exercises including some of the standing exercises described below, but he had still not fully recovered. He had ongoing changes to strength, control and balance through his injured leg but he was also struggling with the changes the accident had had on his overall fitness and lifestyle. For John the key to progress was developing a greater understanding of injuries, damage and pain pathways alongside guidance as to how to build his fitness and physical cofidence back up to the level he once enjoyed. This included glutes exercises to address the reduced strength and control on the right leg, but this was only a part of the overall treatment plan. So how do I address the glutes when assessing and treating in clinic? If I give a strength program to help reduce the risk of injury I will always include exercises to strengthen the glutes. Including some exercises that mimic how they will be used in the person's sport. With any lower limb injury I will always assess how the glutes are working and if I have any concerns I will include glute strength exercises in any rehab program. But rarely is it just the glutes I want to target. I will always tailor the glutes exercise I give to the specific needs, strength and ability of the patient. I would recommend everybody to do some form of strength work as part of their training or even just as part of their life. Its pretty clear from research that all exercise is good for us and strength exercises are one part of this. For people that do engage in sport evidence shows that strength work reduces injury risk and improves performance. For injuries evidence is also strong to show that exercises are one of the most useful tools we have to resolve the injury and reduce pain. And when you engage in any strength program I would include some exercises to work the glutes. So here are some different glutes exercises. I have split them into floor exercises and standing exercises that more closely mimic how we use the glutes when we run. I wouldn’t do all these exercises, just find two or three exercises that you find challenging but not impossible. A combination of floor and standing exercises are good. If you find 30 reps of an exercise is easy then you need to make it more challenging. I have suggested ways of doing this at the end of each exercise. To make harder add a resistance band around the knees for the standard clam and feet for reverse clam. 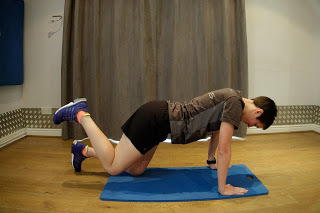 - a great exercise to work the ‘core’ and both glutes. These variations get progressively harder.